Shadwell Fillies' Mile (Group 1) on good ground. A select field of just seven class two-year-olds striving to win prize money of £92,720.85. Godolphin will be hoping Certify can make this four wins from four races. This American bred daughter of Elusive Quality was a bargain buy at $80,000 and trained with great professionalism by Mahmood Al Zarooni. Unbeaten in three starts, this bay filly has proven herself to be top flight taking the Sweet Solera Stakes (Group 3) & May Hill Stakes (Group 2) in gutsy fashion last time when pipping William Muir's talent Purr Along. Certify has proven to be a versatile horse, progressively stepping up in distance to a mile. On form she holds Masarah. Another filly featuring an unblemished record after three straight wins is Mick Channon's Ollie Olga. This January foal was a cracking buy at 42,000gns. An American bred daughter of Stormy Atlantic she is the type to do just enough as seen by her narrow victories but leaving the impression there is more to come. There was a lot to like about her victory in the Prestige Stakes (Group 3) when holding Sky Lantern. Richard Hannon's juvenile went on to win the Moyglare Stud Stakes (Group 1). In fact, her two narrow defeats came against Certify and Ollie Olga. On a line through this runner there is little between the pair. A step up to a mile could bring further improvement for Channon's star filly and her battling qualities could be the difference between winning and losing. It is interesting to note that *Winsili has been supplemented for this race. This daughter of Dansili - running in the Frankel silks - won her maiden in tidy fashion before being held by Lovely Pass who represented Godolphin. Clearly this juvenile is held in high regard by connections but there will need to be marked improvement to press those at the head of the betting. Although quite fancied in the betting, I would rather take a watching brief. 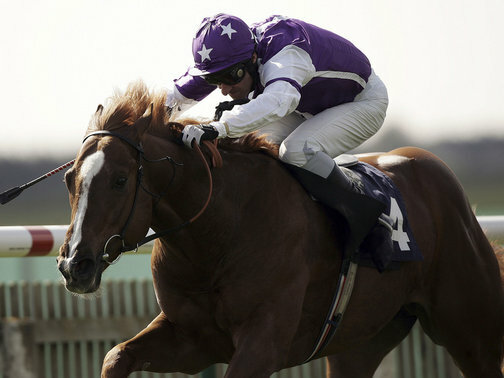 Of the others, Roz has proven to be a surprise package costing only 16,000gns as a yearling. After finishing last on debut, she has made a habit of winning at speculative odds and the type who doesn't shirk the issue with bold front running tactics. Jim Crowley has given the opposition a riding lesson in her two victories and it is likely he will stretch the field once more. This step up to a mile should not be a problem and it could well magnify the advantage of an abundance of pace. Roz adds an intriguing aspect to this contest and if the opposition do keep on her heels she could well prove a tough nut to crack. She beat Purr Along when winning at Listed class although it is fair to say Muir's juvenile didn't help her cause by pulling much too hard. Amazonas is held on that running. Discernable need to improve to figure on recent form. Conclusion: A fascinating race with Certify and Ollie Olga unbeaten after three runs, both achieving Group success. On form there may not be a great deal between the two and both have shown battling qualities. A tough call to separate this pair although I would just favour Ollie Olga simply because she may improve yet again for this step up to a mile. Roz is interesting. Crowley has ridden this filly to perfection on both her victories and I would be confident they will hit the front. This youngster could be something of a dark horse and if slipping the field could go well. The others either look held or need to improve.